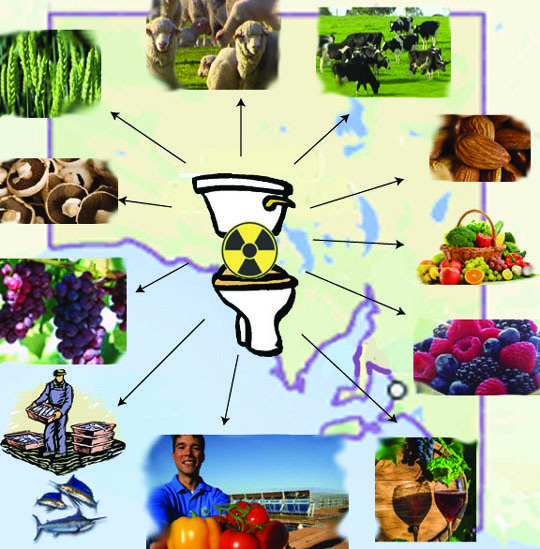 From tears to cheers: three years since South Australia’s nuclear Royal Commission was announced. Dumped nuclear consultation wins international kudos The abandoned community engagement program for South Australia’s doomed nuclear repository has won a brace of international awards in an ironic footnote to the waste dump debate. In Daily, Tom Richardson @tomrichardson. 27 Oct 17 ” …. Nuclear Fuel Cycle Royal Commission Consultation and Response Agency launched in the middle of 2016 was tasked with visiting communities to “explain the Royal Commission’s report and gather important feedback”, with sessions featuring interactive displays, models, videos and fact sheets, “as well as having members of the Response Agency team on hand to answer questions and take community responses”. …….The nuclear response agency’s Aboriginal Engagement Program was named “Project of the Year” and also won the awards’ “Indigenous” category, while the broader Community Engagement Program picked up a high commendation in the “Planning” category……. Premier Jay Weatherill has officially walked away from one of the major policy hallmarks of his term in Government, pronouncing the nuclear waste dump “dead” and vowing he will not revisit it if he wins another term in office. The position appears a significant rhetorical shift from his stance last November, when he pledged to keep the debate alive ahead of a future referendum on the issue of nuclear waste storage, after his own Royal Commission found establishing a local industry could net a “$100 billion income in excess of expenditure”. At the time, his position was seen by critics both inside the Labor Party and more broadly as a refusal to abandon the nuclear dream. But asked about the future of the nuclear dump at a public forum in Victor Harbor this week, Weatherill declared the project “dead”. “Yeah it is,” he reaffirmed to InDaily today……..
After the Victor Harbor forum, Conservation SA chief executive Craig Wilkins said the rhetorical shift should be enshrined in Labor policy, calling on Weatherill to “bury the nuke dump plan for good”. Off The Record: Orchestra now in baton race to replace young gun, The Advertiser April 1, 2017 “…….Hitting voters with ion fist OUR atomic adventure might be dead and buried, but a series of targeted nuclear strikes are about to be launched by the Liberals. Having last November torpedoed Premier Jay Weatherill’s half-hearted push for an international nuclear waste dump, the Libs will now attack him for secret plans to put the dump in various sites across the state, Off the Record has learned. A localised digital and leaflet campaign will accuse Mr Weatherill and his high-level waste dump of risking the ­destruction of agricultural industry and the environment through toxic nuclear leaks. The advertising blitz will expand closer to next March’s election. Regional areas likely to host a dump will be the focus, along with women worried about their children’s futures and those once known as “doctors’ wives” – affluent inner-city Liberal types concerned about the environment and social issues. Liberal leader Steven Marshall says he has an open mind on policy solutions, today declaring South Australia “can’t afford to take one single solitary thing off the table” – only minutes after launching a strident defence of his unilateral move to take nuclear waste storage off the table. The Liberals were put in the spotlight last week when former senator Sean Edwards mused about a push by business supporters to see him installed into state parliament, and possibly to replace Marshall as leader. Edwards refused to rule out either scenario, repeating earlier disenchantment over his party’s decision to withdraw support for a broad discussion over a proposed nuclear waste dump……. “We welcomed the royal commission in the first place, in fact we were the only party that was talking about the nuclear opportunity for South Australia before the last election,” he said. Thought for the day: The Royal Commission proposal for a South Australian dump allowed for 138,000 tonnes of high level waste. But the world produces about 10,000 tonnes every year. Therefore in the time it takes to build the dump, the world has already produced twice the amount waste that the dump can take. Then on top of this there’s the existing 370,000 tonnes of global high level waste to-date with nowhere to go. So talk of Ben-Hur proportions that a dump will stimulate expansion of the nuclear industry, allowing power for countries in poverty, meeting power needs for growing populations, and that it fills a moral obligation is invalidated by the fact the dump can’t even keep pace with such visions. So if we peel away all this hollow rhetoric the only real justification for the dump is to make a fast buck, and the ‘noble’ talk of how the dump will save the world is trumped-up sales hype. 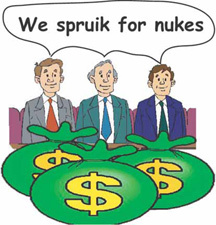 One of the major criticisms of the SA nuclear proposal by the SA Liberals and green groups has been the risk of spending state taxpayer money up front with no certainty of future revenue. TAIWAN’S state-owned energy company has bluntly rejected Investment and Trade Minister Martin Hamilton-Smith’s claim the country would consider paying to help set up a nuclear waste dump in SA, saying in a letter that it “hereby declares this is a false information”. 100,000 years till the danger of contamination of earth, waters and human beings subsides!!! environment to bring up children, a clean environment for every generation? Australia our homeland further into the contamination from which there will be no return? safe and weapons proliferation won’t happen ‘because we say it won’t ‘. no asthma. We were people without sickness. 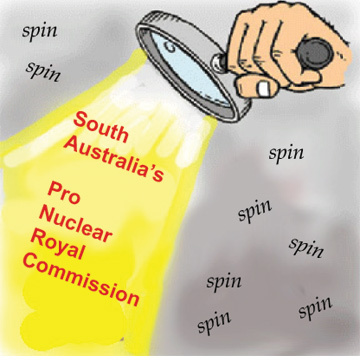 Nuclear Poker: The Premier declares his hand, but who will win?, Adelaide Review, John Spoehr, NOVEMBER 24, 2016 You Don’t generally establish a Royal Commission on a major economic question unless you have an answer in mind. Tom Playford initiated a Royal Commission into the Electricity Industry in South Australia to bring the industry under greater public control. He was fed up with the privately run Adelaide Electric Supply Company (AESC) and was open to radical change. By the mid-1940s, most states had nationalised their electricity industries….. Unlike Jay Weatherill’s pursuit of a nuclear industry in South Australia, Playford had history on his side. Nationalisation of the electricity industry followed a global popular movement for change. Most believed the industry needed to be a servant of the community rather than one of its masters. Bringing the industry under public control was part of the great post-war social democratic revolution, one that profoundly shaped Australia’s post-war development. This was the nuclear age, a time when the terrifying power of atomic energy was unleashed as a terrifying and cataclysmic weapon. The memories of this horror live on like a long dark shadow over post-war generations. Though there have been few of them, each nuclear accident awakens latent fears, reminding us that they can have horrific consequences. It is against the weight of this history that the Premier and the State Government push. They also push against great disappointment – disappointment that the state’s prosperity should, in any way, be tied to becoming a nuclear waste dump. Surely we can do better than that, many South Australians are saying. More than 3000 protestors on Parliament House steps made it clear that a dump was not an option. What frustrates many about the latest twist in the nuclear waste dump debate is the apparent abuse of process when the State Government didn’t get the result it wanted. It has created an expectation that the Citizens’ Jury would guide the decision. When the Jury came out against the dump, the Premier had a plan B – put it to a referendum. The election of Donald Trump sharpened views about the political cost of not listening to the Citizens’ Jury. While the Premier was prepared to take the risk and face accusations of having a tin ear, Opposition Leader Steven Marshall made a captain’s call to oppose the dump on economic grounds. While the Premier alienated many in his traditional support base by being the architect of the impossible, he won new friends on the other side of politics by daring to do what they would not have done themselves. Whether this translates into Labor votes from disgruntled Liberal voters at the March 2018 State election is difficult to know. Having criticised the Opposition Leader for abandoning bi-partisan support, the Premier has few cards left to play in his game of nuclear poker. There has been talk of trying to lock in a customer nation to demonstrate that there is real demand for the dump, but customers will remain cautious, preferring not to declare their hand. Steven Marshall has laid his cards on the table and so too has the Premier. Their parties are divided on the stance they have both taken. …..